For someone fresh out of college or someone that only has a couple of jobs under their belt, this would not be appropriate. But if you have taken a path that has enabled you to develop a diverse set of skills, you might want to put this smack dab at the beginning of your resume. Similarly, if you are competing for a General Manager or executive-level position, you probably need to show diversity. When developing a Skills Summary section, be careful about the order you put the skills in and even the ones you choose to list at all. They should match the type of job you want. It’s fine that five years ago you had a job as an HTML programmer and LAN administrator. But if you are going for a marketing management job, you won’t want to overload the Skills Summary section with a bunch of high-tech skills. Since this section is almost always situated at the very beginning of your resume and will be the first thing the reader looks at, some people will decide to read further strictly based on this section. See the rest of my 10-part series on Resume Writing here. I also have a related 5-part series for Job Hunting and a 7-part series for Interviewing. Hi. 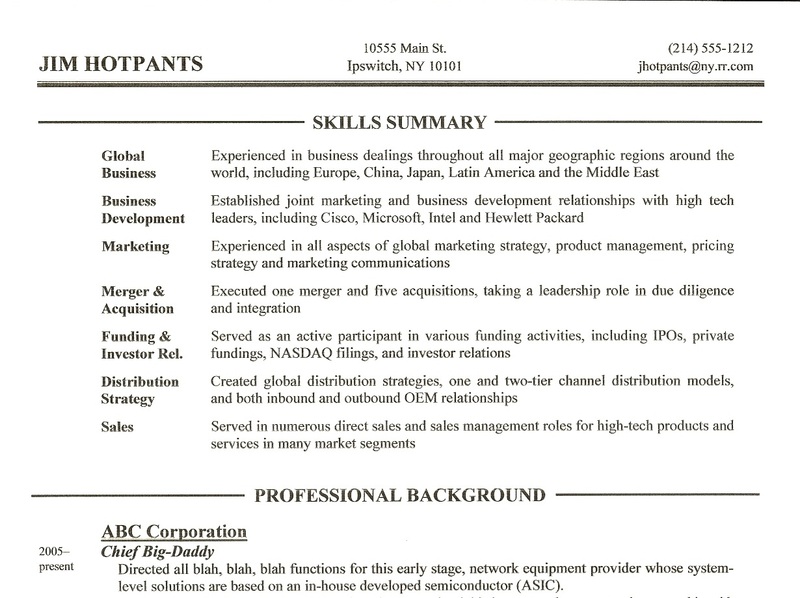 I love the format of your resume. How do you go about creating the section header with the word centered and a line before and after it? I can’t figure out the formatting that will allow me to do this. * The text you’re referring to and the double line below it are in the Header. Double-click at the very top of your Word doc to edit the Header. * Insert your text like you want. I use left, center and right tab markers to align the three columns of text across the two lines. * To get the solid line below, with your cursor in the bottom line of text select the “Borders and Shading” icon from the Home tab. For Setting select “None”. For Style, scroll down and pick the double line you like. I prefer the one that’s thick on the bottom and thin on the top. In the Preview pane on the right, click on the bottom of the shaded text area and confirm the double-line goes across the text space in the Preview. Click OK.
* To tighten the space between the two lines of text, use the Line Spacing “Exactly” setting and experiment with different point sizes (smaller) to get it just right. Thanks. The main thing in question is the sections, like “Professional Experience” or “Education” where the word is centered on the page and a line is on either side of the word. Is there a way to format in a Word Doc or is it more tricky than that? Got it. I don’t know of any formatting trick. I hold the shift key while drawing the horizontal line so that I guarantee a perfectly horizontal line. Also, once I’ve done it once and like the alignment of the far left and far right ends of the lines, I use the cloning feature in Word to create the lines for the other section headers. That way I guarantee the far left and far right ends are the same for every line. To do the cloning, hold down Shift while selecting both lines (left and right sides), then hold down both Shift and CTRL while dragging the lines up or down to the new location. If the middle end of the lines needs to be adjusted for the new location, do that individually whole holding down the Shift key to ensure you keep a horizontal line.